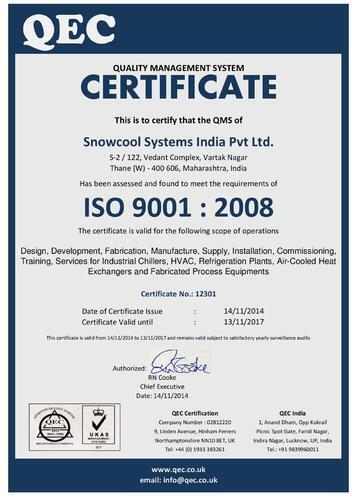 Established in the year 2006, we, 'Snowcool Systems India Private Limited' are engaged in manufacturing, exporting, trading and supplying of Cooling Equipment such as Air Cooled Chillers, Water Cooled Chillers, Ammonia Chilling Plants and many more. Our range is appreciated by the clients based in various parts of India and world for its characteristics such as robust construction, longer service life and high performance. These durable products are manufactured under the guidance of the experts at our sound manufacturing unit using graded alloys and quality electronic components. Further, for our clients' convenience, we undertake the designing and turnkey projects for the products manufactured by us. At our sound manufacturing facility, we undertake the production of our high performance machines. Our quality controllers undertake the testing of the range, to ensure it is in compliance with the degree of prevailing quality standards. Moreover, we also offer after sales services to ensure all the queries are handled within shortest span of time. We have been successful in undertaking turnkey projects for Chilling Plants, HVAC Projects, Marine AC & R Projects, Transport AC & R Projects, Specialty Cooling Projects, Packaged Equipment and System Components. All these factors have helped us in garnering a huge client base across the Indian Subcontinent, East Asia, Middle East and South East Asia. Our mentors 'Mr. Sushil' (CEO), has lead us on the path of success and growth and has very well played is role of a guider. Their ethical business practices have guided our team to achieve the best in line. We have been successful in catering to the requirements of clients, who are based across varied parts of India and world. Our products are designed and developed under the vigilance of experts to ensure they are at par with the requirements of the clients and industry. These high performance products finds application in shipping, construction, transport, electronics, food processing, milk and anodizing. To ensure our clients are satisfied to a highest level, we employ all our mite and expertise it the field of project engineering. We make use of sophisticated machines and latest technology to provide efficient turnkey solutions to our loyal clients. Further, the services executed by us are in designed and rendered in accordance with the requirements of the clients covering all the vital details related to the project. To ensure our organization is flooded with innovative ideas for products and services rendered are of highest standards, we have hired professionals who have unique perspective about various aspects. This has helped our organization to deliver quality products and venture in the field of developing new products. This team of diligent professionals have assisted our management to maintain invulnerable relations with the clients.